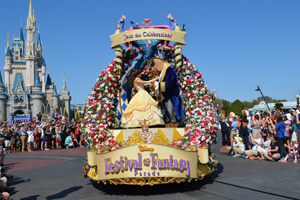 Just hours after the New York Giants won the Super Bowl, Quarterback and MVP Eli Manning was on his way to Walt Disney World! 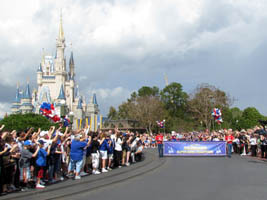 The procession started in Liberty Square, and made it’s way around the hub (below, left), before Manning came into our view. 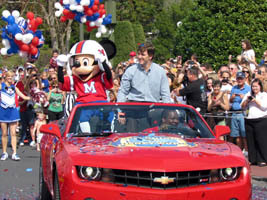 Seated with Mickey Mouse (who was dressed as a football player), Manning was showered with confetti as fans applauded and called out to him (below, right). We just returned from a wonderful (and busy!) 2 week trip to Southern California (below, left). 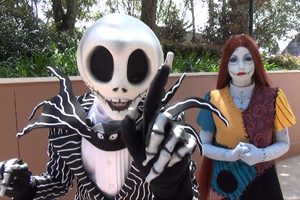 We spent the beginning of the trip at the D23 Expo, a day at Sea World San Diego and another day exploring the L.A. area – including a visit to a Tim Burton exhibit. 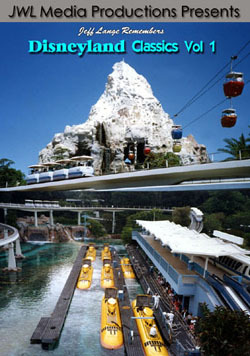 But the rest of the time was spent at Disneyland (below, left). 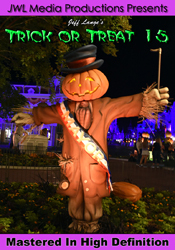 We visit Disneyland each year, and always find many “magical moments” to be had. 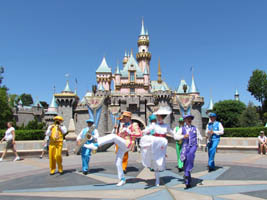 One was a show in front of Sleeping Beauty Castle with Mary Poppins, Bert, and the Pearly Band (below, right). We’ve never seen it before, and it’s a fantastic show! Duffy the Disney Bear made his big debut at Epcot yesterday, with hundreds of guests waiting for his arrival. 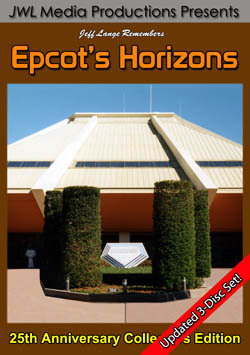 Epcot Vice President Dan Cockerell and Liz Boice, Senior Vice President of Merchandise Development spoke to guests (below, left). 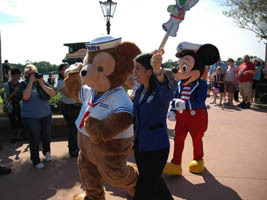 Duffy and Mickey Mouse make their entrance with Ambassadors Vanessa Rosas and Clay Shoemaker (below, right). 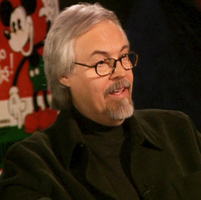 Wayne Allwine, the voice of Disney’s Mickey Mouse for the past 30 years, has died from complications of diabetes. He was 62. Allwine is the third person to voice the beloved character. He started in 1977 working on “The New Mickey Mouse Clubhouse“. 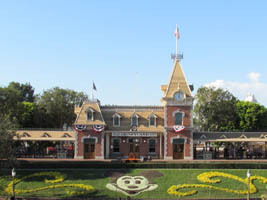 Through the years, he has provided countless hours giving a voice to Mickey, including the film, “Mickey’s Christmas Carol” and even for the “Kingdom Hearts” video game series. 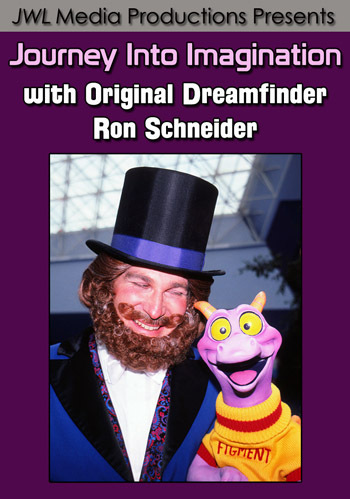 He was named a Disney Legend in 2008. Wayne was also a good friend to the Disney fan community appearing at numerous NFFC and Disneyana conventions to give a face to the voice of the famous mouse. 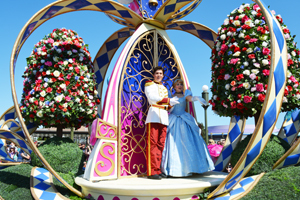 Allwine leaves behind a wife, Russi Taylor, who is the current voice of Minnie Mouse. They were married in Hawaii in 1991. 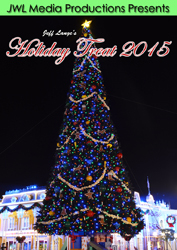 The staff at JeffLangeDVD wish the best for the Allwine family, and their friends during this hard time.